Globally, sunscreen manufacturers face a number of varying laws, regulations, guidelines and recommendations to comply or align with. Each of these essentially have the very best interest of all of us consumers at heart, but there are many contradictions. Ultimately this makes life extremely complicated for sunscreen manufacturers, but at the same time, confusing for us the consumer, as well as those trying to locate a manufacturer that suits your purposes. From a certification perspective, the international standard that sunscreen manufacturers follow for UVB testing is pretty much settled on the Sun Protection factor (SPF). This can range from 4 to over 100. In order to obtain this SPF certification, sunscreen products are subjected to specific test procedures by certified scientific bodies with all the relevant technology to be able to test the sunscreen product. The use of UV filters in suncare preparations is legislated differently in different parts of the world. In some countries and regions they are regulated as cosmetics via a positive listing as in the EU and Japan. In other countries they are legislated as over the counter drugs as in the USA, Canada and Australia. The legal status of each UV filter must be checked for each country the finished formulation will be sold in, ideally before formulation work starts. This is especially important if global formulations are required. The legislation process in most countries is a dynamic process and these limits are subject to changes. The active ingredients approved by these legislative organizations are key to formulations for manufacturers and they vary slightly between these countries. Once compliance to these regulations and listed active ingredients has been obtained, there is the matter of labeling of the products. This has proven to be quite controversial and even led to lawsuits in the USA. Lawsuits were filed against 5 leading sunscreen manufacturers because of the claim that the sunscreen manufacturers provided the public with misleading information about their products that could potentially cause harm. "Sunscreen is the snake oil of the 21st century, and the companies that market it are Fortune 500 snake oil salesmen," claimed attorney Samuel Rudman of New York. The essential grounds for this case, is that although sunscreens protect against the UVB rays that cause sunburn and premature aging, they do little to protect against the UVA rays that cause a deeper level damage, including melanoma, the most deadly form of skin cancer. 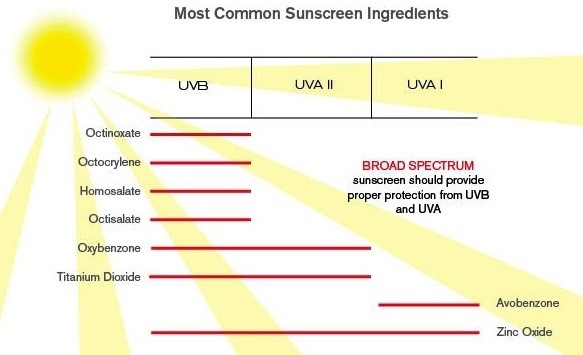 Most sunscreens provide protection for SPF ratings that are well indicated on the packaging. Typical ratings are 15, 30 and 45, with some even as much as 105. The key issue claimed is that these numbers only pertain to UVB rays and not to the UVA rays that are believed to be the cause of deeper skin damage, premature aging and worst of all, melanoma. Even those sunscreens specifically claiming to provide protection against UVA rays can be misleading. Eg. "UVA/UVB sunblock" followed by an SPF rating, implies the rating applies to both UVA and UVB. UVA in fact does not yet have one globally recognized certification process. There are many methods being used across the globe, while the international body that has been set up to focus on establishing a single global standard, deliberates. Worse still, one ingredient used by many manufacturers for UVA protection is Avobenzone, also known as Parsol, and it breaks down rapidly when exposed to sunlight! Use of this ingredient creates a false sense of security for consumers. However, when a sunscreen manufacturer does a great job of researching, developing, designing, marketing, and distributing its line of sun care products, it can lead to a lifetime of devoted customers. To find one is not an easy task it seems.